Take fluorescent lights and yellow filters, add a tank, fins, mask, and you’ve got fluo diving. This magical night dive variation reveals crazily colored coral and impossibly glowing marine life. During a recent stay at one of the top dive resorts worldwide, the Wakatobi Dive Resort in Sulawesi, Indonesia, I was introduced to the miraculous world of fluo diving (a.k.a. fluorescent diving, fluoro diving, UV diving or glow diving). Only very few dive operators in the world offer fluo diving, and even though I’ve dived all over the world (French Polynesia, Panama, St. Lucia, Dominica, etc. ), I’d actually never heard of these terms before. So I was curious to learn more. Essentially, fluo diving is night diving with a UV light that activates the fluorescent colors (in some marine life) that can only be seen with a special yellow filter on your mask. 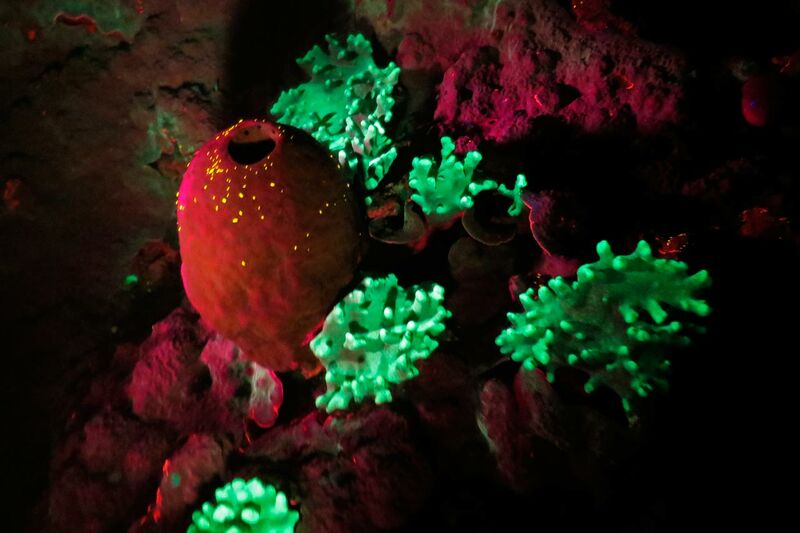 Interestingly enough, fluorescence in marine life wasn’t discovered until recently. Also, nobody knows why some animals glow and others do not (even different members of the same species doesn’t always glow the same way), or why they give off a specific color, or why they glow at all. When I arrived at Wakatobi I had never gone night diving. So, I decided to get one of those dives under my belt before adding fluorescence to the mix. It was a good idea; night diving is disorientating (as visibility is greatly diminished) and can be somewhat dangerous if you’re not careful or don’t have a good guide. Luckily, Wakatobi Dive Resort has excellent guides who got me quickly acclimated to diving in the dark. After only one night dive, I felt confident enough to give fluo diving a try. As I said, the dive guides at Wakatobi are thorough; so, true to form, we weren’t just given fluo diving gear and thrown in the water. We first received an interesting and informative lesson on the theory behind fluo diving and then watched a video and photo presentation that outlined what we should look for and what to expect from our new experience. 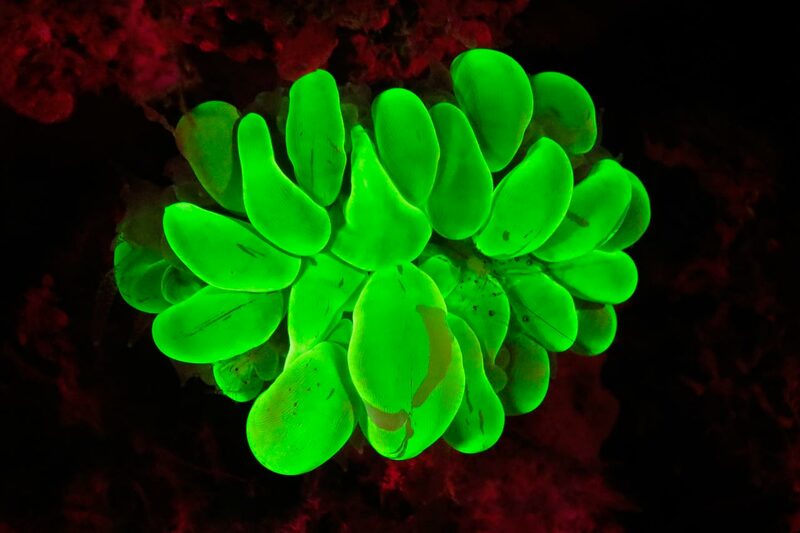 Fluorescence happens because some marine animals and coral absorb high-energy light and re-emit it instantly as low-energy light. These animals only glow while you’re shining a light on them. This is different from phosphorescence, where there is no immediate glowing effect. Instead, light is stored and re-emitted over time, glowing long after the original light source is gone. After our tutorial, we grabbed our dive gear, fixed yellow filters to our masks and camera and got in the water. We visited a site we’d already dived during the day, which is always a good idea for a night dive. I turned out to be a very good idea to do a normal night dive before trying fluo diving. First of all, UV torches give you even less light than normal night-diving torches, and that adds to the challenge, but nothing can prepare you for the explosion of color. I became so bedazzled by my first fluorescent “sighting”, I seemed to forgot everything around me. The yellow-green colors of a brain coral (that’s somewhat boring in daylight) got stronger and more mysterious the closer I got. 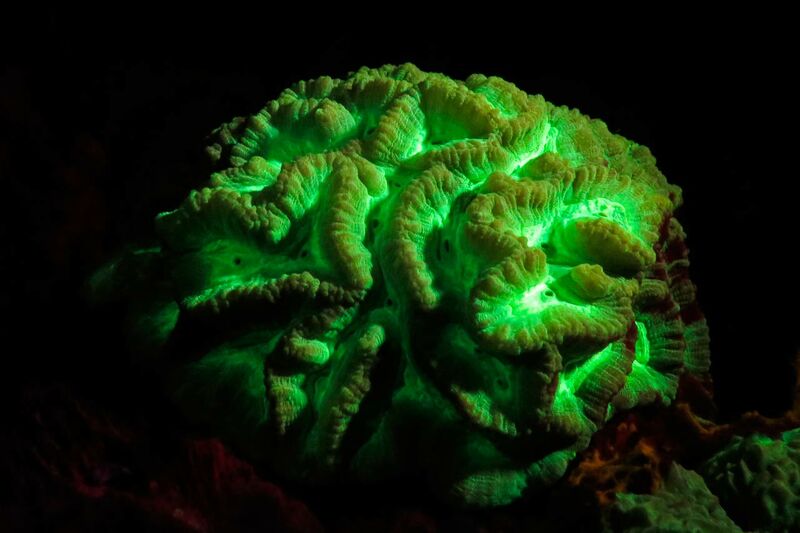 My first sight during fluo diving was an insanely green-glowing brain coral. As I was adjusting to this eerie new experience, I saw some other amazing colors shining in the light of one of my fellow divers. This eerie explosion of purple, orange, and blue, mixed with yellow and green would have normally left me speechless if I didn’t already have a regulator in my mouth. 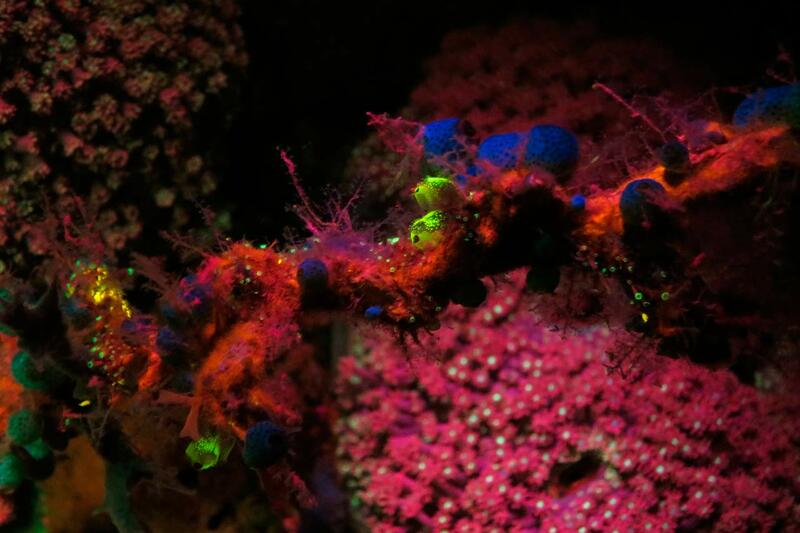 A bright orange glowing whip coral covered with blue and yellow sponges, pink soft coral and tiny yellow-red anemones. These amazing impossible colors contrasted against the inky black of the deep sea in a way that was otherworldly. Even tiny, otherwise invisible, sea lice glittered in an electric orange that seemed to say “look what I can do!”. 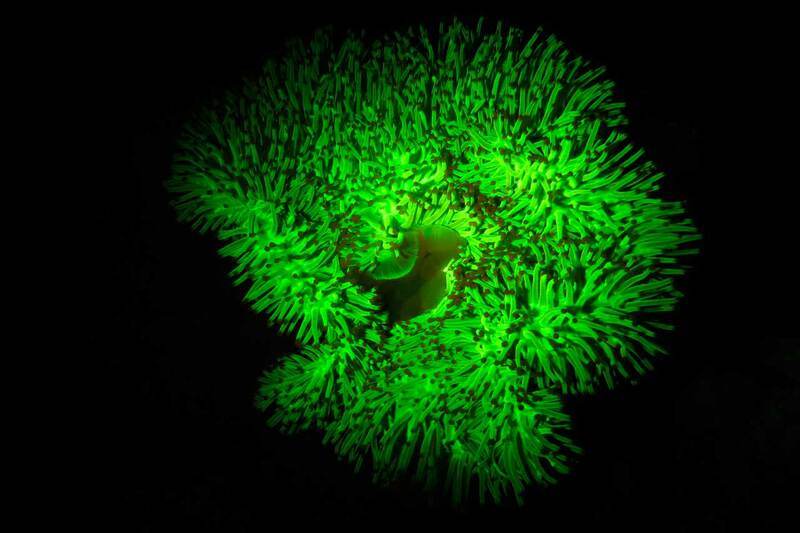 A large anemone which (unlike its neighbors of the same species) decided to put on a glow show. We didn’t see any sharks or moray eels, but some of them apparently also glow in yellow-green. Conversely, some of the most colorful creatures by day are dull and boring under the UV lamp. In this way, fluo diving inverts all your experiences and expectations. There was so much to look at that I’d never seen before, I didn’t feel the need to travel as far as I might on a normal night dive. The same was true with the rest of the group, so we all stayed close together. In addition, Wakatobi Dive Resort only matches two people per guide for this kind of dive, so safety is a high priority. This added security enabled me to relax and focus on the beautiful colors. Also, having plenty of people around me meant we we could share in each other’s discoveries. If you look closely, you can see tiny sea lice; invisible during the day, at night on a fluo dive they glow in a clearly visible yellow. In all the places we’ve dived across the globe, we’ve never encountered fluo diving. That might have something to do with the cost of the gear. A good UV filter for your torch will run you almost US $1,000 (plus the price for a good flashlight), and I guess the yellow filter for the mask isn’t cheap either. We heard that you can get a rough idea of what fluo diving is like by putting a blue film on your torch and a yellow film on your mask, but haven’t tried it yet. (If you have, let us know how it works!). 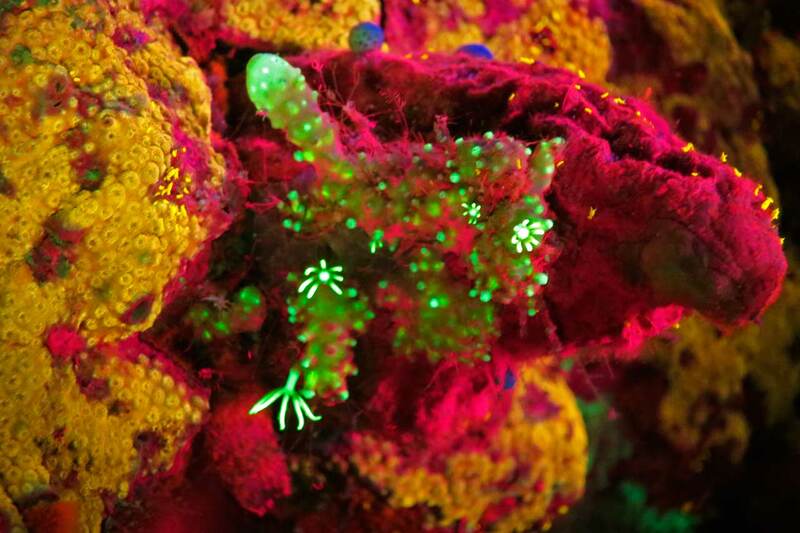 Can you see the tiny shrimp in this glowing bubble coral? They are fairly transparent, but some dark spots give them away. Fluo diving was the icing on the cake during our stay at the world-class Wakatobi Dive Resort. One of the best dive operations we’ve encountered, Wakatobi has excellent gear and a safe, experienced and attentive staff. On or off water, the resort is magnificent, with its elegant waterside bungalows and awesome food. It’s also a top macro diving paradise for all those who are into discovering the small stuff. If you love to dive but haven’t gone fluo diving yet, put it on your list! It’ll open up a world you never knew existed. Have you been fluo diving yet? How was it and where did you do it? Have we got you eager to dive Sulawesi and try fluo diving? Then why not spend your next vacation at Wakatobi Dive Resort? 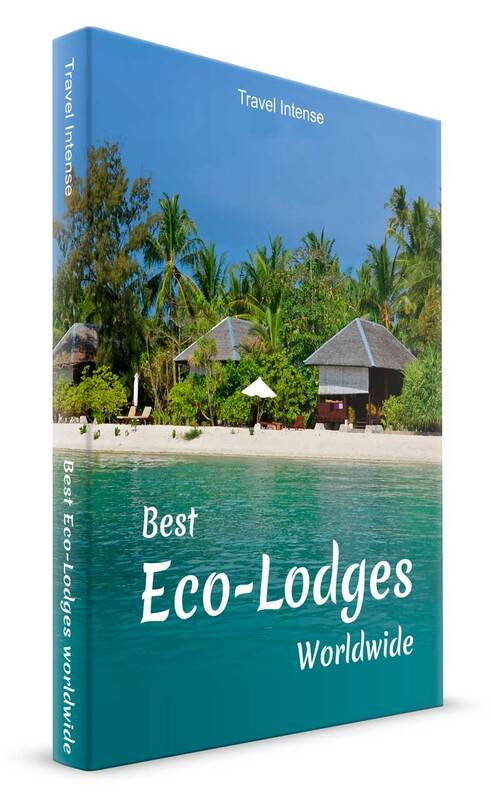 This remote eco-lodge has a special offer for all Travel Intense readers. Simply click on the image below and get your code! Just send us a message indicating the nature of your inquiry (e.g., discount code Wakatobi) and we’ll give you a discount code that you can use to either receive a free spa treatment, a USD 100 resort credit, or a 30% nitrox discount with Wakatobi. 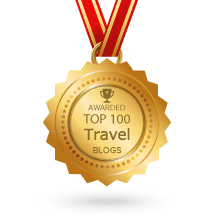 Eric got the travel writing bug after working as a journalist in Cambodia in the mid-90s. Over the years he has written for numerous U.S. magazines and newspapers and taught writing at universities. He finally decided to go full-time with his travel writing because life is short, the world is big and he wants to experience it all.